Australian Michael Katsidis could still fight Ricky Hatton in Manchester later this year, according to Katsidis's manager-trainer Brendon Smith. Hatton, 30, was knocked out in two rounds by Manny Pacquiao in Las Vegas in the early hours of Sunday morning. However, Hatton has not announced his retirement and is rumoured to be keen on one more fight in his home city. "I believe we can make it happen, but it's Ricky's call if he wants it," Smith told BBC Sport. Smith added: "There were discussions well before the Hatton-Pacquiao fight and we're still interested. "We haven't thrown Michael's name up as a challenge to Ricky because of his loss to Pacquiao, we had talks with [Hatton's promoters] Golden Boy a long time before. "We're still available if they want to do the fight in Manchester. So we're just waiting to hear the decision on Ricky's future. "But we need to make a move soon because we want Michael to fight before the end of the year." The devastating nature of Hatton's defeat by Pacquiao has led many to call for the former light-welterweight king's retirement, with British legend Sir Henry Cooper the latest to suggest he should hang up his gloves. "Ricky should retire, he's got the tell-tale signs now," said Cooper, who fought Muhammad Ali twice and who retired at the age of 36. "When you're like Ricky and you're prepared to take two punches to land one you've only got so many fights in you. "It's catching up with him now. A couple of years ago this wouldn't have happened but he's been knocked out twice now. It's time to call it a day. "He's got millions and will live like a lord for the rest of his life, what does he want to keep fighting for?" But Hatton refused to make a snap decision after the fight, and he is widely expected to announce his intentions at the opening of his new gym in Hyde next Thursday. And Oscar de la Hoya, head of Golden Boy Promotions, said Hatton could "still have a bright future" in the sport. "It doesn't have to be the end. Ricky's young and still has what it takes," added six-weight world champion De la Hoya, who retired after being beaten by Pacquiao last December. "Look, I have six losses in my career. Just because you lose, it isn't the end for you. It's about how you come back. "When Ricky lost to Floyd Mayweather Jr [in 2007] people thought it was the end. I'm sure Ricky felt a bit depressed. But he came back and beat Paul Malignaggi in some style." 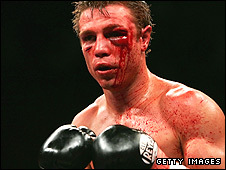 The hard-hitting Katsidis, 28, has two defeats from 27 fights, including 21 knockouts, although he has fought most of his career at lightweight. He sparred with fellow Aussie Kostya Tszyu before Tszyu's defeat to Hatton in 2005, and has fought on British soil before, retiring former British lightweight champion Graham Earl in a brutal encounter at Wembley in February 2007. And he has since shown he can mix it at world level, giving two-weight world champion Joel Casamayor an almighty scrap last March before being stopped in 10 rounds and dropping a split decision to former undisputed lightweight champion Juan Diaz last September. In his most recent fight, Katsidis battered former two-weight world champion Jesus Chavez into submission in eight rounds, and some would fancy him to beat Hatton, whose punch-resistance looked at rock-bottom in his defeat by Pacquiao. "Michael had a great win recently over Jesus Chavez and is coming into the peak of his career and I'm sure Ricky would not want to go out on such a devastating loss," added Smith. "It would be a great fight for England and the rest of the world, a great match-up."